Updated Q3 2018 maps for 10 countries of the Middle East, South Caucasus and Asia are now available to the Navitel Navigator users. The Middle East, South Caucasus and Asia Q3 2018 map update includes 10 countries — Armenia, Azerbaijan, Georgia, India, Iran, Kyrgyzstan, Pakistan, Tajikistan, Turkey, Uzbekistan. The map of Azejbaijan contains 4 313 cities and settlements, of which 57 are available for road networks and address search. The POI database was updated and extended to 27 586 POIs. Total length of the road graph is 34 769 km. The address databases and road networks of Bilgah, Mashtaga, and Nardaran have been updated. House-level address search has been updated in the following towns and settlements: Mamedli, Mehdiabad, and Pirallahi. The map of Armenia contains 985 cities and settlements, of which 51 are available for road networks and address search. The POI database was updated – the Q3 2018 map of Armenia includes 13 809 POIs (gas stations, ATMs, cafes, shopping centres, tourist attractions, etc.). Total length of the road graph is 23 268 km. The map of India contains 594 627 cities and settlements, of which 6 614 are available for road networks and address search. The map includes 5 300 607 POI. Road network and address database have been updated. Total length of the road graph is 2 167 659 km. In the Q3 2018 map of India 8 217 526 unique addresses are available for search. All the maps have been supplemented with the residential and industrial infrastructure of all the cities and settlements with address search feature. Detailed and clear road networks include all streets, lanes and roads considering traffic direction, road junctions, roundabouts and other information vital for successful navigation. You can see the detailed information on every map in the Maps section of the official website. Important! 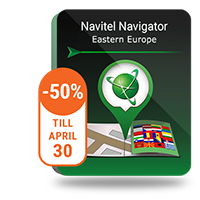 Please note that the maps of the Q3 2018 release only work with Navitel Navigator 9.10.1619 or higher. Truck navigation feature is available in Armenia, Azerbaijan, Georgia, India, Iran, Kyrgyzstan, Pakistan, Tajikistan, Uzbekistan.